Terry Pratchett 2010 Challenge Wrap-up! 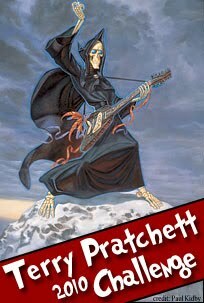 So you must all know by now how much I LOVE Terry Pratchett and his Discworld books, right? No? Really? Have I not gone on and on about how brilliant he is? So naturally I HAD to participate in the Terry Pratchett 2010 Challenge hosted by Marg of Reading Adventures. I joined as a Guard of the City Watch (coincidentally my favourite group in the Discworld series) and needed to read 4-5 books or watch their adaptations. I was actually planning to do a bit of re-reading as well, but alas, too many books and so little time. But, I did complete the challenge and also got to see Sir Terry himself at the midnight launch of his latest novel, I Shall Wear Midnight and bagged myself a signed copy of his novel. Sweet! You can tell it’s all the new stuff, can’t you? Yup, I’ve been reading Pratchett’s books for the last 20 years. I do have to say that they get better and better and I much prefer the later novels to the earlier ones. The characters are more developed and less of a caricature, there’s depth and darkness and a real love of the world (both ours and the Discworld). And you’ve got to love the Nac Mac Feegle! The adaptations also keep getting better with each one as well. You can check out what the other participants have been reading here. So, have you read any books by Terry Pratchett yet? If not, WHY NOT?? Heh. I read 3 Pratchetts in 1997. Then 3 in 2010 (Unseen Academicals, Reaper Man, and Equal Rites). How’s that for a bimodal distribution? Interesting. So the next 3 you’ll read will be in 2023? « Once Upon a Time IV Challenge Wrap-up!